Here is a Guide For WordPress Local Development with Vagrant. Vagrant is Better than MAMP, WAMP or XAMPP for localhost development and is related to Virtual Appliance. Usually, we used to install WAMP or XAMPP, which gradually got backdated with the advent of Virtual Appliances. Now, WordPress Local Development with Vagrant, is almost as the most advanced setup. MAMP, WAMP or XAMPP are basically LAMP stacks. But, now most commonly, for better setup; we run Nginx on Cloud Server, not Apache2. MAMP, WAMP or XAMPP, has no optimization for WordPress on localhost and is not identical to the production environment, chance to fail to work on the production server is huge. For WordPress running Nginx, MySQL, PHP-FPM and any Object Cache, we basically need the exact combination. So, the minimum need is a Virtualization Capable Processors. Usually, a 15″ MacBook Pro is taken as standard as OS X is UNIX, the technical specifications demands to know only the year of manufacturing. You’ll require VirtualBox, as you can understand. Most commonly, example is given with VVV – Varying Vagrant Vagrants. Our guide is for Mac for VVV. Linux users will obviously have no problem. We have no support for Micro & Soft Win dozzz. That vagrant plugin install vagrant-hostsupdater command actually did the automated work. Now if you want to use https://puphpet.com, then the git clone will not be git://github.com/Varying-Vagrant-Vagrants/VVV.git, otherwise the steps are kind of same. PuPHPet is better but we gave an example with VVV, which usually people uses. This Article Has Been Shared 7382 Times! Visual editor or TinyMCE is not showing up in WordPress is quite common issue, in most cases it goes beyond a situation to be solved. Here are alternatives. 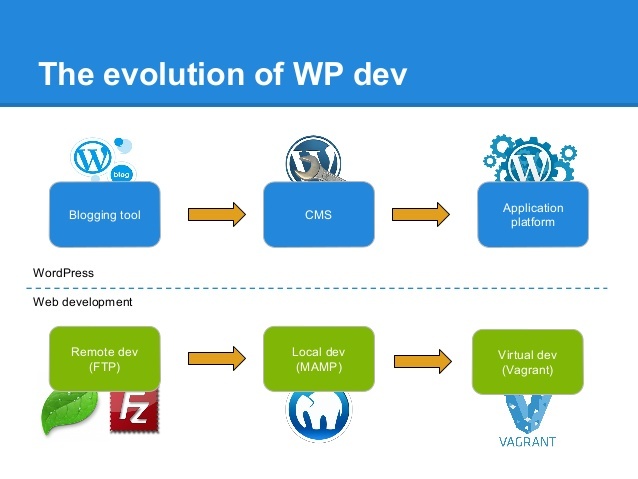 Cite this article as: Abhishek Ghosh, "WordPress Local Development with Vagrant," in The Customize Windows, November 6, 2014, April 23, 2019, https://thecustomizewindows.com/2014/11/wordpress-local-development-vagrant/.